Look, I'm trying to type this with a straight face, but this life-sized Pikachu plush is so adorable I might just be desperately clawing at the screen in a bid to reach through my monitor and cuddle the crap out of it. The One True Pikachu, if you will. Accept no skinny substitutes! How on earth did Ash lug Pikachu around if he weighed that much!? The poor kid must have spinal problems - even Beams give you a 'Beams x Pokémon' bag to carry the hefty guy around. 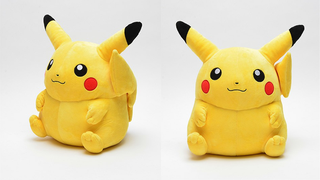 No word on whether Beams will have the Pikachu for sale in any of its international locations, or if the plush will make its way to the west some other way - but oh god, I want one.